Walsine Pierce: STEAK ON A STONE: Sizzle Sizzle Sizzle !!! OUT TO DINNER WITH FRIENDS! One of the many joys of the above dining group is checking out potential restaurants. After a progressive dinner to start the year, each couple gets to choose a restaurant that is different with good food at a reasonable price. The host couple is responsible for personally checking out the restaurant in advance. My and Julie's month was May. Due to lot's of reasons, not to mention that we each had a virus infection and I was in the hospital for a week and a half with heart problems, we couldn't make it happen in May. No one had June so we just backed our choice up a month. One long night a year ago Julie couldn't sleep. During the wee hours of the night she was up watching a dining show. Several caught her attention but one that stood out for fun eating was Steak On A Stone. Earlier this year that unusual restaurant build a locally. We checked it out yesterday. 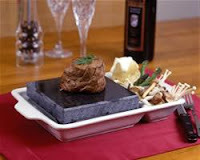 The food is brought to the diner on a lava stone that is heated to 750 degrees. That's hot! The diner cuts bite sized pieces and cooks them to their own taste. Unlike grilling, where the juices are cooked out of the meat, this stone sears the meat surface keeping the juices in. A bite size of meat will cook to "medium" in twenty seconds. Steaks come in Filet Mignon, New York Strip, Ribeye or Sirloin Strip. The diner may also choose to cook Jumbo Shrimp or Duck Breast. Don't want to do the cooking? You may also order your food fully prepared. 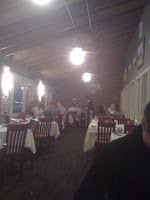 Greek owned, the restaurant also specialize in authenic Greek Cuisine. You can get Avgolemono Soup, Saganaki or Grape Leaves rolled around beef, topped with lemon sauce. Want Boneless Chicken breast grilled and covered with spinach, mushrooms and provolone cheese on Clabatta Bread. No Sweat! Mousaka, Pastitsio or Spanakotyropita? Yep! They have that too. Sea food? How about a lobster? The steaks on a stone come with a wide assortment of dipping sauces. To go with our New York strips we chose a House Steak Sauce, Peppercorn Merlot, a Bernaise, and Horseradish. We serve strip steaks often at home, either in ten or twelve ounce sizes. Although our steaks were supposedly twelve ounces, it was at least twice as thick as the steaks we buy. They were huge! The picture on the left is what's left when my steak was half eaten. There was a wide assortment of side dishes. We both chose salads. Julie got the usual baked potato. It was a big potato. I had french fried sweet potato strips. No seasoning, just the sweet potato. You know how a potato cools off as you finish your meal. Not here. You pop it onto the stone and each bite is sizzling hot. The meal is served with a freshly baked loaf of bread with herbed butter. The bread alone was worth the trip to this restaurant. After the meal is complete the stone is still over 500 degrees. The special dish that holds the stone is hot. The table beneath the dish is hot. You can feet the heat as you cook each bite. It may not sound like it but it was fun. It was also very, very tasty. Dessert? Are you kidding? We were stuffed. I helped Julie finish her steak although I was full when mine was gone. Very important, the coffee was kept fresh and hot by the waitress. 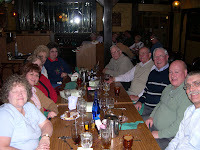 For groups of eight or more they take reservations, normally we number twelve. They will serve 12 at one table. Friday nights is less busy than Saturday. It looks like everyone can come on Saturday, June 20th. Sample menus and literature will go out tomorrow, June 9th. "A friend is like a bowl of Jelly Beans......good to the bottom of the bowl"
That sounds yummy and I don't even like beef!